This layout was created using blue cardstock, Retro Squares paper, Provo Craft Blue Circles paper, KI Sand Linen paper, Patchwork Chocolate Brown paper, tan cardstock, brown ink, Cloud 9 Alphabet stickers and Sandylion Bedtime Pooh & Friends stickers. 1. Use the blue cardstock as your background. 2. Cut a piece of Retro Squares paper measuring 29.5cm by 29.5cm. Ink around the edges with brown ink and when dry, glue to the centre of your page. 3. Cut a piece of Provo Craft Blue Circles paper 11.5cm by 29.5cm. Tear at an angle down one of the long edges to create a white edge. Using brown ink, ink around the other three edges. When dry, glue vertically down the right side of your page, still leaving the small blue border all the way around, as shown above. 4. Cut a strip of KI Sand Linen paper measuring 29.5cm by 1.3cm. Ink around the edges with brown ink. When dry, glue horizontally across your page approximately 1cm from the top. 5. Cut a piece of Patchwork Chocolate Brown paper measuring 15.2cm by 20.2cm. Ink around the edges with brown ink. When dry, glue vertically to your page approximately 7.7cm from the left edge and 3.6cm from the top edge. 6. Mat a vertical 4×6 photo with tan cardstock and glue in the centre of your chocolate brown paper from the previous step. 7. Cut a square of Patchwork Chocolate Brown paper measuring 5cm by 5cm. Place a Pooh and Piglet reading sticker from Sandylion Bedtime Pooh & Friends stickers in the centre. 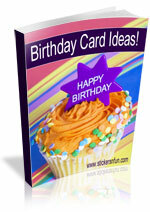 Mat with tan cardstock and glue towards the top left corner of your photo, as shown above. 8. Use Cloud 9 Alphabet stickers (or any brown square alphabet stickers) to write your title underneath your photo, as shown above. Place a sleeping Tigger sticker from Sandylion Bedtime Pooh & Friends stickers so it looks like he is resting on your title. 9. Finally, place three Pooh & Friends pillow fight stickers from Sandylion Bedtime Pooh & Friends stickers in the bottom left corner of your page. What do you think? 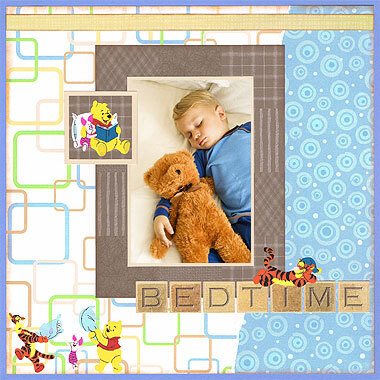 Do you like this scrapbooking idea using Winnie the Pooh stickers? Do you have any questions? Would you have done anything different? We’d love to hear from you! Please leave a comment below. This entry was posted on Monday, May 4th, 2009 at 5:17 pm	and is filed under Disney, Kids, Scrapbooking Stickers. You can follow any responses to this entry through the RSS 2.0 feed. You can leave a response, or trackback from your own site. any user on Skype , Have you ever had your money stolen by a scammer ? - Skype Resolver Have ever been threaatened on Skype? Go to Skype. Right click on the namee of the perszon You wish to Skype resolver. Right click their Profile Name. Click on Copy (this copies to clipboard). Thiis site was… how doo you say it? Relevant!! Finally I have found something which helped me. these people instead are the central sign of the person’s standing in the overall game. are similar in theory but are usually triangular and thus have three values per tile. He has coached 89 games. both level of conversation they permit and also the number of students that they appeal to. While playing with key pad, students are also learning hand eye coordination and muscle mass memory. Kids are familiar with games and over 90 percent of school children play all of them. I you do not have an Xbone here in the office, but I simply now bought” both the customer and the Gatorade Sports Functionality Football Teaching Camp” on the internet for $0. AT ALL regarding needing XBL gold. Wait, unless online games are free with ads… WHO THE PARTICULAR $#! Capital t WOULD WANT TO DOWN LOAD Gatorade Sports activities Performance Football Training Camp”?!?! get people who are less inclined to exercise to start relocating. online brands. As games have become the mainstream activity, those have become enormous. While Skype investigates reports of tools that capture user�s IP address, they have not maintained enough to formulate a strategy and overcome privacy exploitation. And unless you’re an expert in the field, it can be almost impossible to get your head around. but really in order to continue to gain rankings it is important that the off-page factors are taken care of. Every marketing method has to be sales-oriented and proven successful. Search-Engine Marketing is fundamental as people utilize the internet more and more. out of fashion a few years ago. Große Artikel! Das ist die Art von indo das sollte geteilt werden über diie Internet. Disgrace uum Google für jetzt nicht Positionierung dieser Post Obere!